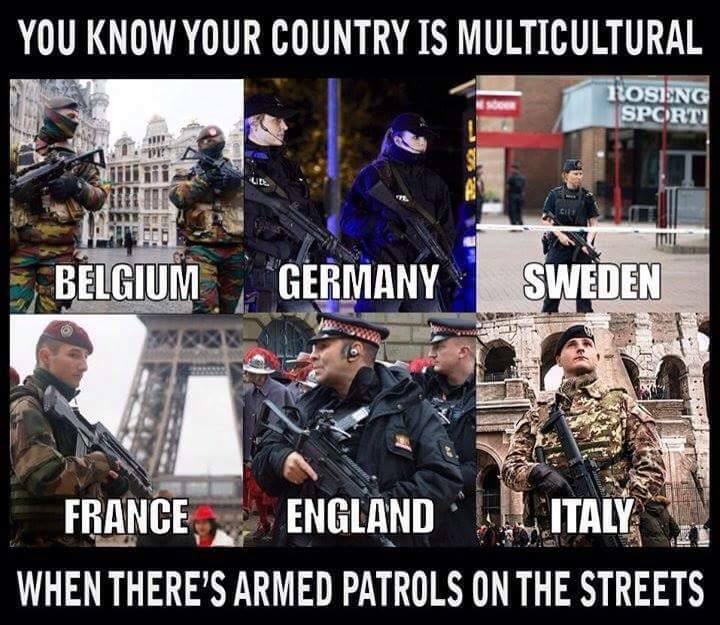 President Trump warned Europe that the migrant influx to their countries is "changing the fabric" of their nations and causing them to lose their culture. "I think what has happened to Europe is a shame," Trump told The Sun. "Allowing the immigration to take place in Europe is a shame," he said. "I think it changed the fabric of Europe and, unless you act very quickly, it's never going to be what it was and I don't mean that in a positive way." “So I think allowing millions and millions of people to come into Europe is very, very sad," Trump said. "I think you are losing your culture. Look around. You go through certain areas that didn't exist ten or 15 years ago." Q: Ewen MacAskill from The Guardian. Your trip to the UK, there are lots of protests planned in London and elsewhere. How do you feel about that? THE PRESIDENT: I think it's fine. I mean, I think they like me a lot in the UK. I think they agree with me on immigration. I'm very strong on immigration. I made a point today — I said, you've got to stop. You're ruining your — you're going to have a lot of problems. You see what's going on throughout the world with immigration. I probably, at least partially, won an election because of immigration. If you look at Italy — Giuseppe, who I got to know quite well over the last month and a half, he won his election because of strong immigration policies on Italy. I think that a lot of the people in the UK — I think that's why Brexit happened. Now, I don't know what's going on with the negotiation. Who knows. But — and I guess that's become a very interesting point of contention. I said I'm going to a few hotspots. We have NATO, then we have the UK, and then we have Putin. And I said, Putin may be the easiest of them all. You never know. But I'm going to a pretty hotspot right now, right, with a lot of resignations. But I will say that immigration is a very important thing, and I told them today, the EU — the European Union — better be very careful, because immigration is taking over Europe, and they better be very, very careful. And I said that loud and clear. Q: And Brexit — sorry, sir, because you are going to the UK. What will be your message on Brexit? 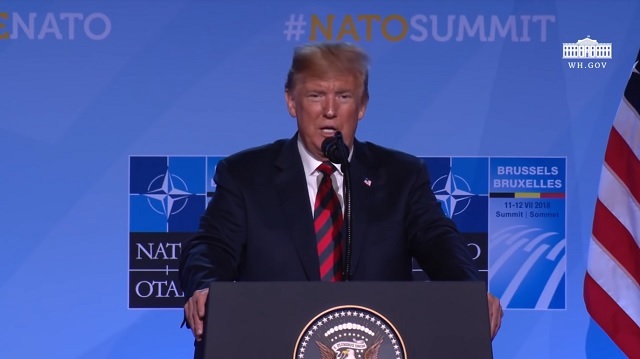 THE PRESIDENT: Well, Brexit is a — you know, I've been reading a lot about Brexit over the last couple of days, and it seems to be turning a little bit differently where they're getting at least partially involved back with the European Union. I have no message. It's not for me to say. I own a lot of property there. I'm going to Scotland while I wait for the meeting. I have Turnberry in Scotland, which is a magical place — one of my favorite places. I'm going there for two days while I wait for the Monday meeting. But it's not for me to say what they should be doing in the UK. I have great friendships. My mother was born in Scotland. I have great friendships over there. We have a wonderful ambassador — Woody Johnson. And he's doing — by the way, Woody is doing a great job. But it's not for me to say. I'd like to see him be able to work it so it could go quickly, whatever they work out. THE PRESIDENT: Is it heartbreaking? THE PRESIDENT: Oh, hard Brexit. I see. (Laughter.) I thought you said it was heartbreaking. I said, that might be going a little bit too far, right? (Laughter.) Heartbreak. Is it heartbreaking? A lot of things are heartbreaking. No, I would say that Brexit is Brexit. It's not like — I guess we'll use the term "hard Brexit." I assume that's what you mean. The people voted to break it up, so I would imagine that's what they'll do. But maybe they're taking a little bit of a different route. So I don't know if that's what they voted for. I just want the people to be happy. They're great people. And I do think I have — I'm sure there will be protests, because there are always protests. But I think — there were protests the night of the election, both ways. But in the end, we got 206 electoral — 306 electoral votes. And one state said — you know, it was interesting, one of the states we won, Wisconsin — I didn't even realize this until fairly recently — that was the one state Ronald Reagan didn't win when he ran the board his second time. He didn't win Wisconsin, and we won Wisconsin. So, you know, we had a great night. Protests? There might be protests. But I believe that the people in the UK — Scotland, Ireland. As you know, I have property in Ireland; I have property all over. I think that those people, they like me a lot, and they agree with me on immigration. And I think that's why you have Brexit in the first place, because of immigration.